I’m so pleased to have been nominated and shortlisted, let alone win an award like this. I’m proud to be part of such a fantastic team and will look forward to celebrating with them in recognition of our collective efforts. 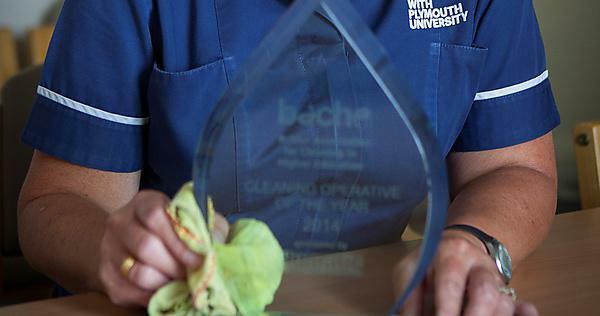 A Cleaning Supervisor at the University of Plymouth has won a national award in recognition of her outstanding work. Sandra Hussey received the Cleaning Supervisor of the Year Award at the British Association of Cleaning in Higher Education (BACHE) conference at Queen’s University in Belfast on 19 June. After being nominated by University Facilities Manager, Sarah Haywood, Sandra won for her willingness to ‘go the extra mile’ for her team, co-ordinating staff and working additional hours for Open Days; offering outstanding pastoral support, including the voluntary role of Harassment Advisor; in addition to making sure staff are trained and feel empowered to use new technology. Sandra has also significantly contributed to raising money for University partner charity, Brain Tumour Research, in memory of previous line manager John McMahon, who died from the disease. Having been a Cleaning Supervisor at the University since 1998, Sandra is currently responsible for 30 staff based across six key buildings both on the main campus and at Royal William Yard.